These lovely tin cans are from a collection of a handyman of very vintage years who wanted to clean out space in his basement. I was very pleased to help by taking away as many cans as he was willing to sell. Lots of dirt of the ages, rust, spider webs. 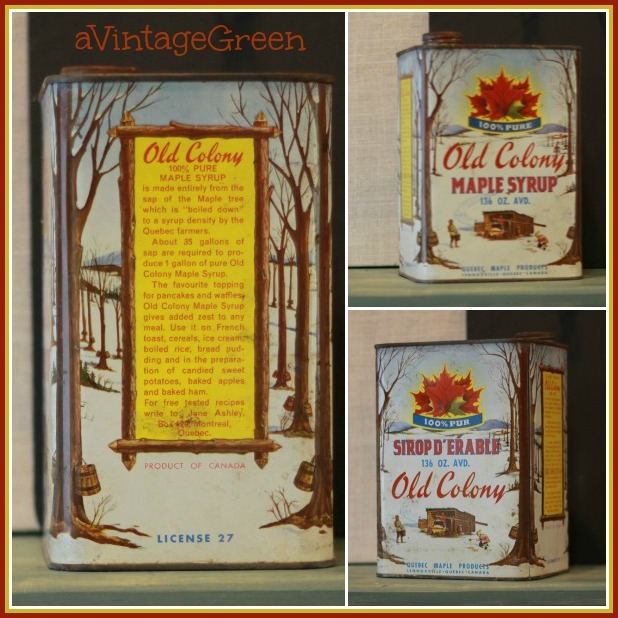 The Old Colony Maple Syrup from Quebec was my favorite of these finds. 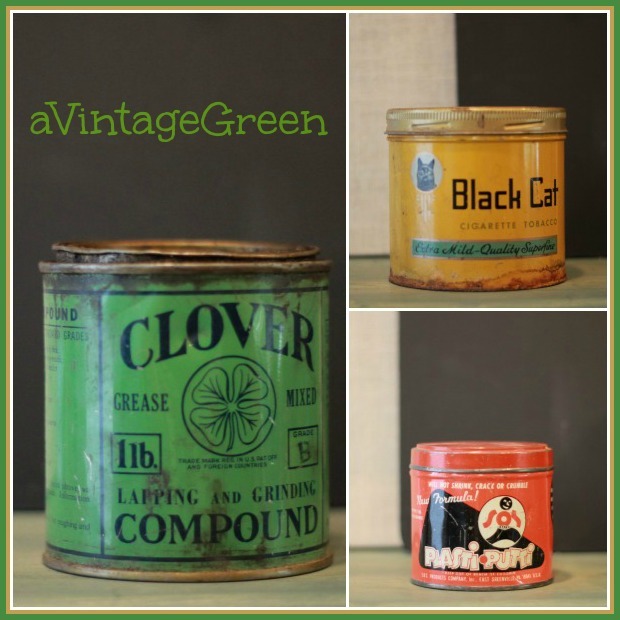 A few food tins, vintage. Followed by some non food tins, also vintage. Vignettes/decorations for the funky junky home. 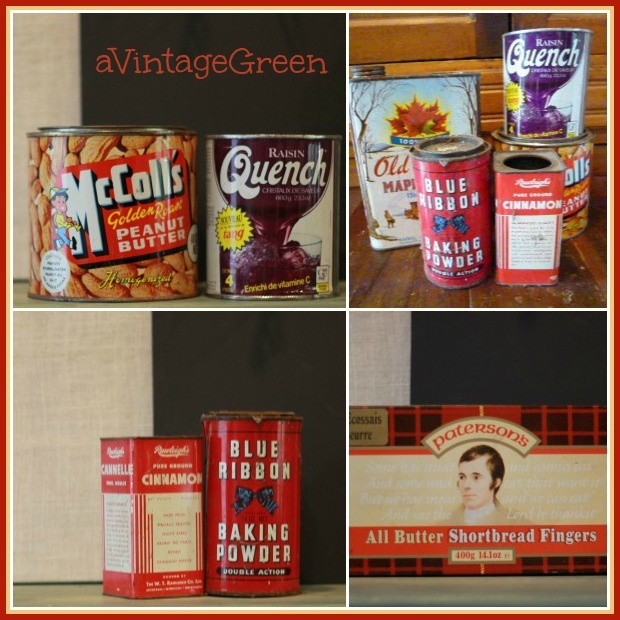 See you again Thursday, posting at 7 a.m.
At our former home I had space above my kitchen cabinets for display and I had lots of colorful tins, but only one was truly vintage. Have fun styling your tins. Wow! You scored some neat old tins. Will you keep them or sell them? Added them to my booth. Kept a couple though. Love the graphics. My grandfather used old tins to store all his small items. I still have a collection of coffee tins he used. I love the color and the graphics. 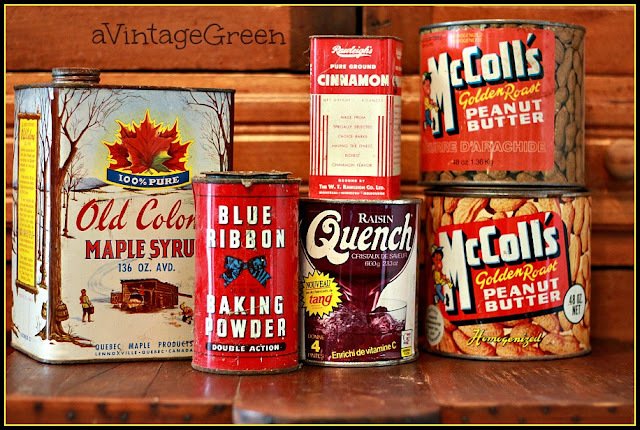 Love old tins-- very nice collection there! These really are some great old tins!! What some sweet treasures. What a sweet man! Love all of them. Makes me miss my country kitchen so much! Love your great collection of tins. I have a collection featured above my kitchen cabinets but mine were purchased when we moved in which has been 24 years. 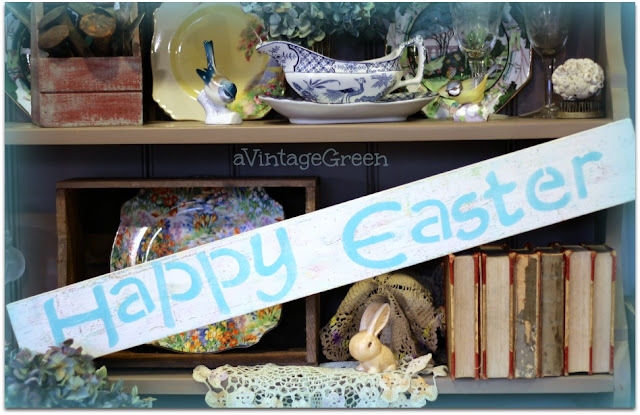 Your "a Vintage Green" blog is one I hope to keep up with! Joy... the Old Colony syrup tin is a keeper. Love it. I really love old tins, so colorful and great graphic. I am also attracted to the metal spools that held wire and string. Have a wonderful day. oh my goodness I love your old cans--I have a bunch from an old dump we found on our property from the 40s and 50s--so cool to see them all piled up!! How fun! Love their bright colors and old graphics.